1954 | What happened in…. The Marlboro Man is a figure used in tobacco advertising campaign for Marlboro cigarettes. In the United States, where the campaign originated, it was used from 1954 to 1999. 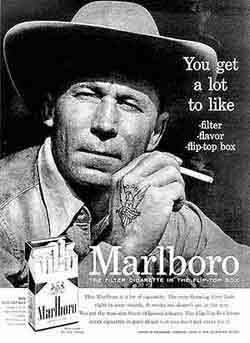 The Marlboro Man was first conceived by Leo Burnett in 1954. The image involves a rugged cowboy or cowboys, in nature with only a cigarette. The advertisements were originally conceived as a way to popularize filtered cigarettes, which at the time were considered feminine. The Marlboro advertising campaign, created by Leo Burnett Worldwide, is said to be one of the most brilliant advertisement campaigns of all time. It transformed a feminine campaign, with the slogan “Mild as May”, into one that was masculine, in a matter of months. Although there were many Marlboro Men, the cowboy proved to be the most popular. This led to the “Marlboro Cowboy” and “Marlboro Country” campaigns.